We are just working on finishing up a couple of projects in San Rafael and Mill Valley that incorporate play friendly synthetic turf with play structures and basketball courts. The owners of both projects have small children and wanted to create a safe and low maintenance outdoor play space for their kids. 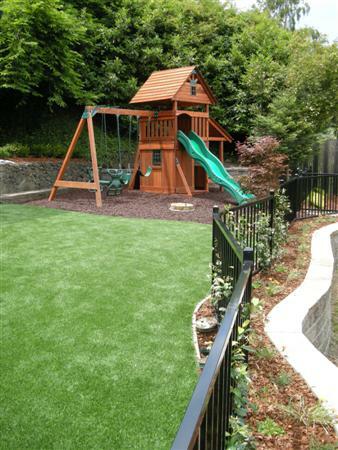 In Mill Valley we installed a synthetic lawn with a play structure surrounded by rubber mulch. The rubber mulch is one of the most absorbent materials for play structures, which worked well in the compact space of the play area and the play tower and slide and this project. In San Rafael we installed a play grade synthetic turf with a premium mat backing for better fall absorption. The turf we used here was also denser and incorporated dead thatch yarn making it look much more realistic. We incorporated the lawn with a concrete patio and basketball court. The basketball court featured an adjustable hoop with tempered glass backboard that we installed. 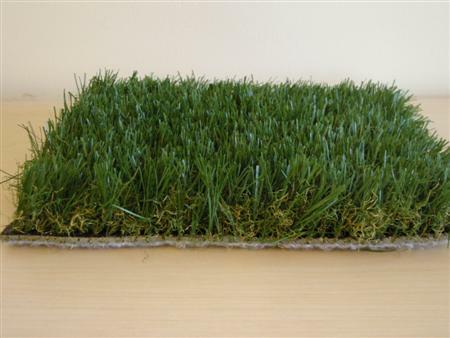 Denser synthetic turf has more fibers, requiring less maintenance. Premium backing provides more cushioning and better feel.